Click on the puppy culture banner's to find out more. No planned litters at this time. Click here to read about the AKC limited registration. We breed for temperament, health, work abiltiy and excellent family dogs. All puppies go home at 8 weeks old with first Distemper & Parvo vaccine, Microchip, wormed and vet checked. committed to the well being of each puppy produced, for it entire life. In fact, returning your puppy to us if you can not keep it at any time during it life is a REQUIREMENT of our purchase contract. PLEASE NOTE: We do not sell puppies to Puppy Mills, Brokers, or Pet Stores. 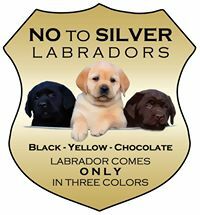 We do not sell puppies as breeding stock for mixed breed "designer dogs" or to any breeder intentionally breeding mismarked Labs. We do not sell puppies to those planning to train and resell the dog. We are looking for forever homes that are the best possible match for each puppy and this is in the best interest of the puppies, the new owners, and our breeding program. We reserve the right to refuse sale to anyone for any reason and may cancel a reservation at any time. We reserve the right to keep any puppy from one of our litters and to hold back any puppy for an extended care period if required before releasing to it new home. When is the best age to get a puppy?